The BM-27 Uragan (Russian: Ураган, lit. 'Hurricane'; GRAU index 9P140) is a self-propelled multiple rocket launcher system designed in the Soviet Union. It began its service with the Soviet Army in the late 1970s, and was its first modern spin and fin stabilized heavy multiple rocket launcher. 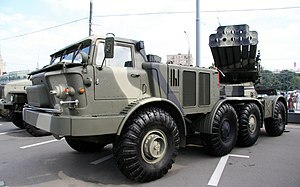 The BM-27 Uragan is capable of launching 220 mm rockets from 16 launch tubes mounted on the rear of a ZIL-135 8x8 chassis. This vehicle is extremely similar to that used in the FROG-7 free flight rocket system. It has two gasoline engines that power its 20 tonnes to a maximum speed of 65 kilometers per hour. One engine drives the four wheels on the left of the truck, while the other engine drives the four wheels on the right. The ZIL-135 has eight wheel drive, but only the front and rear axles are used for steering. It has a maximum cruising range of 500 kilometers. The cab of the ZIL-135 is NBC protected, allowing the rockets to be fired without exposing the crew to possible contaminants. The six-man crew can emplace or displace the system in three minutes. The BM-27 can use HE-FRAG, chemical, explosive or scatterable mine (PTM-3 or PFM-1) submunition equipped rockets, all of which are detonated by electric timing fuses. Each rocket weighs 280.4 kilograms. The warheads weigh between 90 and 100 kilograms, depending on type. A full salvo of 16 rockets can be fired in 20 seconds and can engage targets within a range of 35 kilometers. 9P140 Uragan: Standard variant on ZIL-135 truck. Uragan-1M: Variant presented to the public in 2007; all processes are automated. Can also fire the 300 mm rockets of the BM-30 Smerch system. Reloading is simplified by substituting barrels; can be fitted with two banks of 6 300 mm launch tubes or 15 220 mm launch tubes. Deliveries to the Russian Army started as of September 2016. 9A53 Uragan-U: Successor with 2 × 15 launch tubes; presented in 2009 on 8×8 MZKT-7930. 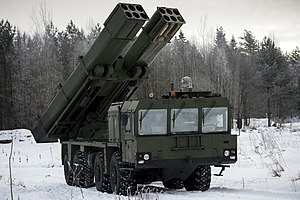 Thanks to its modular assembly the BM-30 Smerch and BM-21 Grad rockets can also be fired. Bastion-03: Prototype by Ukrainian company AvtoKrAZ, presented in 2010. Installed on a 6×6 truck type KrAZ-63221RA. BM-27 Uragan in Russian service. 23 August 2018. Georgia - Saw limited usage during Abkhazia War, out of service. Yemen - Over 50. Seen intensive action in the ongoing civil war. ^ a b c d e f g h i j k l Prenatt 2016, p. 37. ^ Salem, Harriet. "'I Couldn't Move for Five Minutes from Fear': An Investigation Into Cluster Bombs in Eastern Ukraine". Vice.com. Vice. Retrieved 23 October 2014. ^ a b c Prenatt 2016, p. 36. ^ Red Steel: Soviet Tanks and Combat Vehicles of the Cold War, by Russell Phillips, pub Shilka, 2013, p140. ^ "ЦАМТО / Новости / Серийные поставки реактивных систем залпового огня «Торнадо-С» планируется начать в 2017 году". www.armstrade.org. Retrieved 13 April 2018. ^ "Новейший реактивный «Ураган-М1» (видео) - Еженедельник «Военно-промышленный курьер»". vpk-news.ru. Retrieved 13 April 2018. ^ Military Balance 2016, p. 449. Prenatt, Jamie; Hook, Adam (2016). Katyusha – Russian Multiple Rocket Launchers 1941–Present. New Vanguard 235. Oxford: Osprey Publishing Ltd. ISBN 978-1-4728-1086-1. 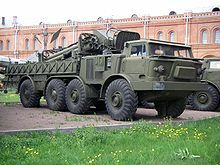 Wikimedia Commons has media related to BM-27 Uragan.